Longtime Foundation executive has been serving as acting president and CEO for past year. 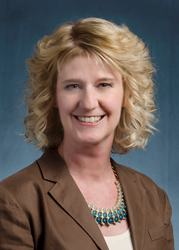 The Board of Trustees of the Ewing Marion Kauffman Foundation today announced the appointment of Wendy Guillies as the Foundation’s new president and chief executive officer. Guillies, a respected, longtime Foundation executive, has served as acting president and CEO since July 1, 2014. "Over the past several months, we conducted a robust, national search for the next leader of the Foundation. In the final analysis, it was clear that the best candidate to lead us into the future was already here," said John Sherman, member of the Board of Trustees and chair of the search committee. "For the past 15 years, Wendy has played a significant role in our success and we are poised to make a greater impact under her leadership in the years ahead." Under Guillies, the Foundation will continue to implement its 10-year strategic plan to carry out Ewing Kauffman’s intent to improve educational outcomes, accelerate entrepreneurship and support institutions and civic initiatives in the Kansas City region. The Foundation actively engages in entrepreneurship research and programs in Kansas City with the goal of creating a vibrant entrepreneurial ecosystem, including its support of 1 Million Cups, Pipeline, KCSourceLink, UMKC’s Free Enterprise Center, the Greater Kansas City Chamber’s Big 5 Entrepreneurship initiative and the recent 1WeekKC celebration. In addition, the Foundation continues to serve as a national and international thought leader on the growth of entrepreneurship and startups. The new Kauffman Entrepreneurship Index, published last week, provides a comprehensive look at national startup trends, including at the state and metropolitan levels. The Foundation’s support of the Global Entrepreneurship Congress, an annual gathering spurred by the Global Entrepreneurship Week initiative, has stimulated efforts to enhance the global workforce and economy. The Global Entrepreneurship Congress named Kansas City a top five emerging city in 2015. The Foundation’s education work focuses on student access to high-quality public school options and education opportunities beyond high school, particularly for students from lower-income urban communities. Most recently, the Foundation worked with Kansas City Public Schools and several local partners to support City Year, a highly regarded national nonprofit that recruits recent college graduates to provide tutoring and other teacher support in public schools. The Foundation also announced a series of strategic education investments earlier this year to support school projects and educator pipelines. The Foundation operates a charter public school and provides postsecondary support to thousands of students in the community. During her 15-year tenure at the Foundation, Guillies has served as a member of the executive leadership team and worked directly with the past three CEOs. In addition to being instrumental in the development and early implementation of the Foundation’s strategic plan, she also is responsible for the conception and growth of Global Entrepreneurship Week, one of the Kauffman Foundation’s most far-reaching and highly leveraged initiatives, which takes place in Kansas City, across the United States and in more than 150 countries around the world each November. Guillies serves on the board of KCSourceLink and Kauffman FastTrac, the Foundation's longest-running entrepreneurship education program. In 2014, she was appointed to the Greater Kansas City Chamber of Commerce's Board of Directors and is a member of its Executive Committee. Guillies also was selected for the 2014 class of Women Executives in Kansas City by Ingram's magazine.